Capitalizing on the knowledge and expertise gained during the development of the Quad Envelope 60A, the VC AHDBDSR 64A represents our commitment towards perfecting the modular Envelope Generator. The 64A is a single envelope &quot;one knob per function&quot; real-time design with no hidden features that is a major step up from the standard ADSR with added Hold, Break and two stage Decay for surgical precision over short envelope contours. Envelope segment times and levels can be modulated individually or in groups, with CV destination assignment via MOD SELECT panel control. Envelope amplitude or level is CV controllable by internal VCA. Amplitude control is an ideal use of the MCV 63B Velocity control feature or in use with any other modules that generate CVs. The 64A can also be used as a 5 stage LFO in LOOP mode with the ability to reset the LFO cycle by RE-TRIGGER input pulse. In envelope mode RE-TRIGGER can re fire the envelope while GATE is high or GATE alone can be used to trigger envelope in the conventional manner. 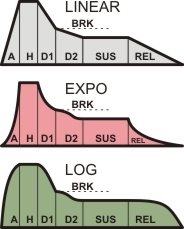 Other features include Linear, Expo and Log contour shapes as illustrated below. Super fast attack time at 0.3mS, roughly 3 times faster than traditional EGs. Stage Min Dur. Max Dur.